Chemically, mafic rocks are enriched in iron, magnesium and calcium and typically dark in color. In contrast the felsic rocks are typically light in color and enriched in aluminium and silicon along with potassium and sodium. 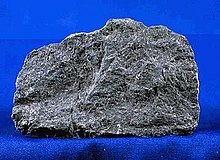 The mafic rocks also typically have a higher density than felsic rocks. The term roughly corresponds to the older basic rock class. Mafic lava, before cooling, has a low viscosity, in comparison with felsic lava, due to the lower silica content in mafic magma. Water and other volatiles can more easily and gradually escape from mafic lava. As a result, eruptions of volcanoes made of mafic lavas are less explosively violent than felsic-lava eruptions. Most mafic-lava volcanoes are shield volcanoes, like those in Hawaii.